The Dram Nest: a perfect home for your starter colony, completely handmade in Canada! Great for: a young queen with a small colony: this makes the perfect starter home. Lasts for: the structure itself will last for many years, but a standard colony will grow out of this 1-1.5 years (at which point you'll need to upgrade them to a larger home such as the Cube). Every one of these intricate handcrafted formicarium are designed and made with your ants' needs in mind by our partners at AntsNational. Their small size makes them appropriate for a starter colony: housing your young queen in a formicarium that is too large, or too open, will stress her out and may increase mortality rates. This size will ensure your ants are healthy, happy and well-housed until the colony outgrows it, which will take longer than a year. At that point you will need to upgrade to another size, such as The Cube. 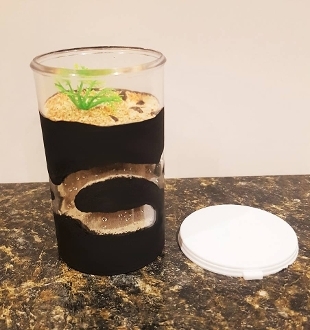 This design has air holes in the bottom hydration layer (not accessible to the ants) for keeping your nest humid: these holes can have water dripped into them to re-moisten the bottom layer and keep your nest hydrated. Non-toxic, custom made substrate that both absorbs and holds humidity, and cannot be chewed through (highly secure!). This substrate is the secret to our nest's success! There is nothing else like it on the market. The nest can also be re-used, should the need arise. We recommend cleaning this nest ONLY when it is uninhabited. We believe these formicaria to be the best available on the market. Not only are they the most functional, safe option for your new friends, they also look fantastic! If you are buying your ants from us and choose not to house them in one of our nests, please keep in mind that we will no guarantee the ants. Dram Nests are shipped empty, for the security of your ants. Dram Nest is provided by and copyright to our partners at Ants National.